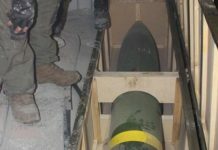 The strike hit a Hamas military compound and a weapons production facility. 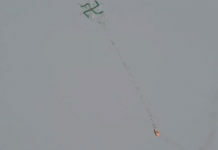 Israel Air Force jets struck several Hamas targets in the northern Gaza Strip overnight Wednesday. Four targets inside a military compound belonging to the Islamist group were hit, including buildings and infrastructure. Three additional targets inside a weapons production facility were also attacked. 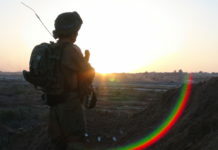 The strikes were carried out in retaliation for the heavy machine-gun fire from Gaza on the city of Sderot on Wednesday as well as a number of shooting attacks against IDF troops along the border during the day, the army said. Following the enemy gunfire on Sderot, IDF tanks shelled two Hamas observation posts in southern Gaza. Mayor Alon Davidi said the response was insufficient and called for a much sharper strike. 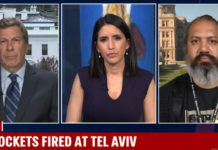 “The punishment for a bullet must be the same as the punishment for a rocket,” Davidi said, adding that the machine-gun fire on homes in his city was just as serious as a rocket, attack tunnels under the border or attempts to infiltrate Israel by cutting through the security fence. Earlier on Wednesday, IDF tanks struck several Hamas outposts in the southern Gaza Strip, in response to shots fired at Israeli forces. 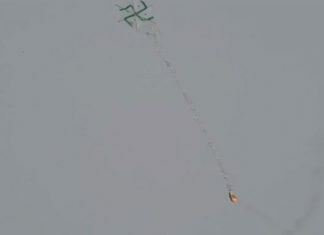 The gunfire came after two days of riots along the Gaza border fence left – according to Hamas – 62 Palestinians dead. 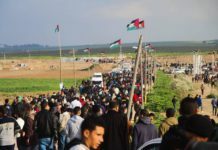 That day, more than 40,000 Gazans protests in a total of 13 locations along the border, with at least two serious incidents in which armed men belonging to Hamas tried to attack IDF troops. Sixty Palestinians were killed on Monday and an additional two were killed by IDF fire on Tuesday, again, according to Hamas. The deadly violence was condemned by the international community, despite the Hamas saying that 50 of the casualties were members of the terrorist organization, and the Islamic Jihad terrorist group claiming three of the casualties as its members. 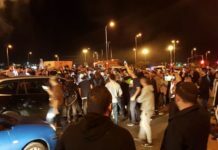 One Palestinian rioter who was arrested by IDF soldiers after breaching the border fence and infiltrating Israel on Tuesday said Hamas has orchestrated the violent demonstrations in order to remain in power. As the humanitarian situation in the coastal enclave had badly deteriorated, “Hamas organized the demonstrations so that people would not turn on them,” the man said in Arabic, in a video released by the IDF on Tuesday. “Hamas controls everything in the Strip. Hamas sends us messages to our Facebook accounts and to our cellphones. They come to mosques handing out leaflet saying to go to the fence. When there’s electricity and televisions can be turned on, all you can see is the march [to the border]. People got worn down and bored, and I’m one of those people,” he continued.